Sophisticated show home in coveted Morrison. This home exemplifies the finest quality in craftsmanship and materials, with no luxury overlooked. A timeless stone exterior opens through a solid oak and tempered glass entry. The open concept foyer with heated natural stone tile flooring boasts double coat closets with automatic interior lighting and a 20’ ceiling with central chandelier. 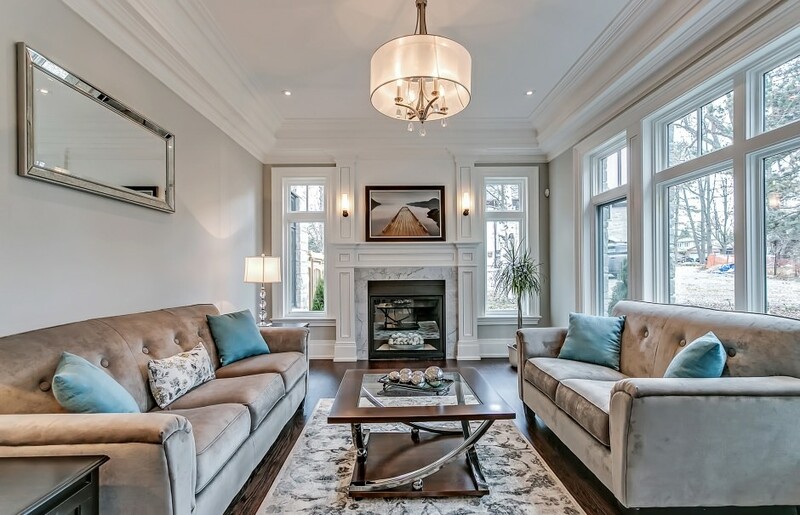 Oak hardwood flooring, intricate millwork, crown moulding, mini halogen pot lighting, and built-in ceiling speakers are just some of the high-end features seen throughout this home. 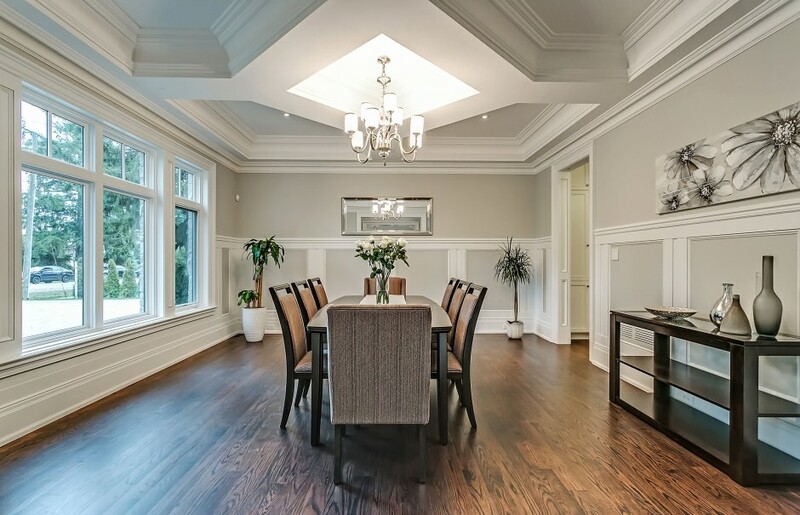 The foyer is flanked by a living room with gas fireplace and panoramic windows with transoms, and the formal dining room with coffered ceiling with central chandelier and convenient access to the servery with Sub Zero wine fridge and built-in Miele cappuccino maker. The open concept family room and eat-in gourmet kitchen is an impressive space to entertain, flooded with natural light from the full-height window panels. Surrounded by custom full height soft-close cabinetry with tempered glass accent cabinets and under-cabinet lighting, an oversized two-tiered walnut island with crystal pendent lighting provides ample seating and a functional prep space. Quartz countertops meet a stunning high-gloss stone tile backsplash. High-end built-in appliances include a chef grade stainless steel Wolf double oven with 6-burner gas cooktop and griddle, and side-by-side full size Sub Zero refrigerator and Sub Zero freezer. 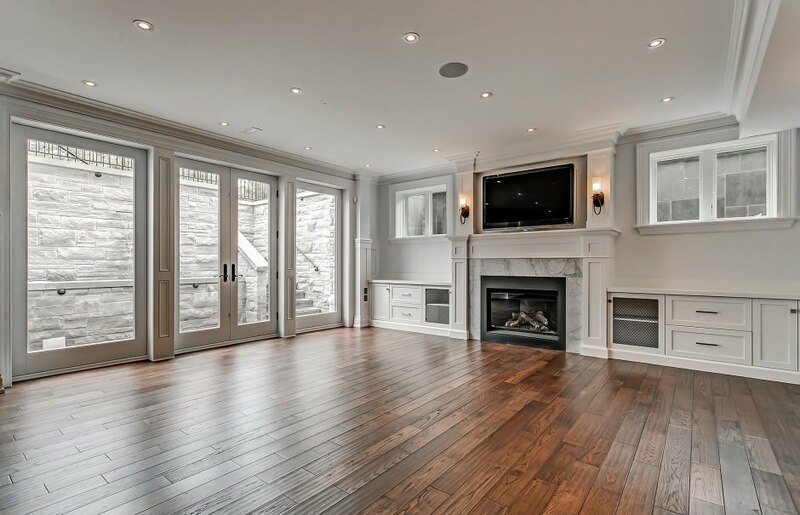 The spacious breakfast area, with double French door walkout to the rear yard, flows into a comfortable family room with gas fireplace inset custom bookshelves. A double mudroom with charming bench seating and ample storage provides an additional service entry, inside access to the tandem triple car garage, and a three-piece bathroom conveniently located next to the access to the outdoor living room. Traditional wall sconces and multiple frosted glass skylights light the second level landing. Double doors open to a true master retreat. Custom built-in shelving flanks a linear gas fireplace with marble surround, while a single French door opens to a 315 sq ft terrace. 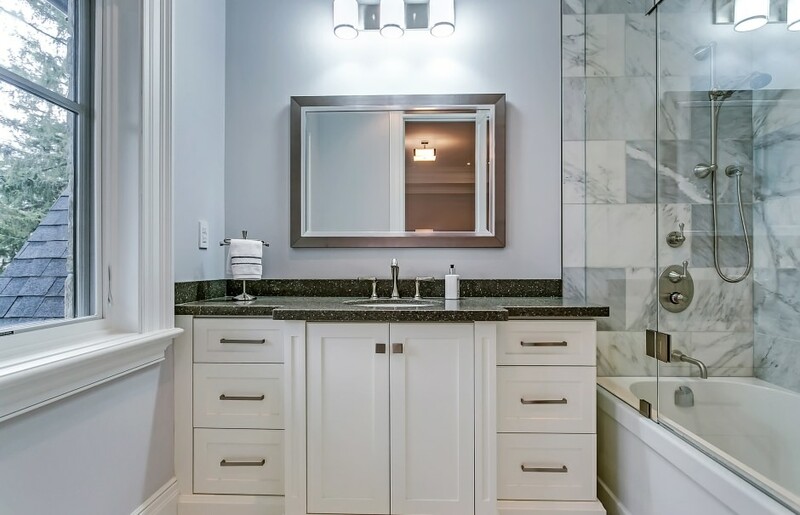 The five-piece ensuite captures an airy feel, with heated marble tile flooring, traditional wainscoting, His & Hers vanity with quartz countertop, seamless glass double shower, and standalone soaker tub. A dressing room is furnished with custom built-in walnut storage. 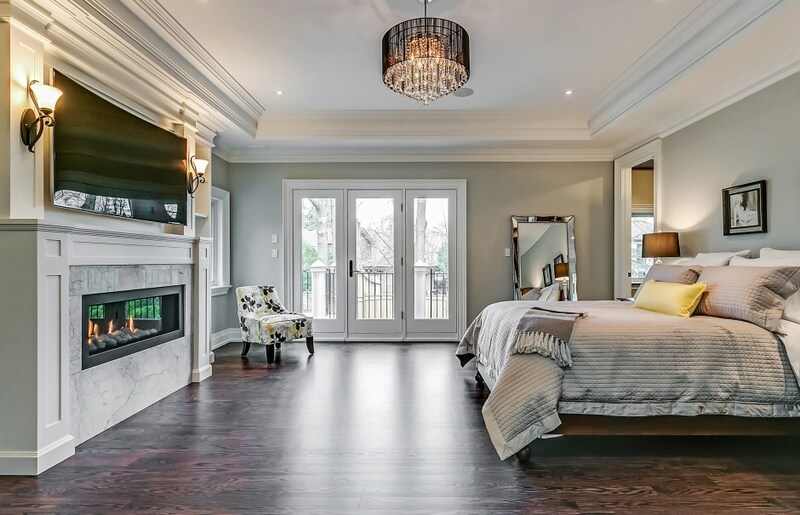 Three additional generous bedrooms with custom closets, three dedicated ensuites, and a bright laundry room completes the second level of the home. 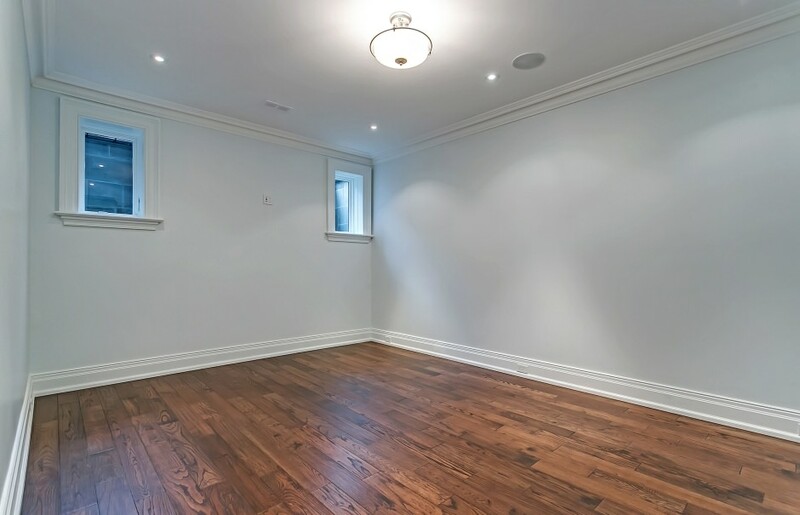 The fully finished walk-up lower level provides almost 3,300 sq ft of additional living space, with 9’ ceilings and heated engineered hardwood flooring throughout. The recreation room is an entertainer’s dream, with a custom built-in wet bar with walnut cabinetry, high-end appliances, and a two-tiered granite countertop with overhang for bar seating opposite the temperature controlled wine room. Double French doors open to the flagstone walk-up with waterfall feature. A state of the art theatre room is equipped with built-in surround sound and ceiling speakers, an Epson projector and EluneVision projection screen. 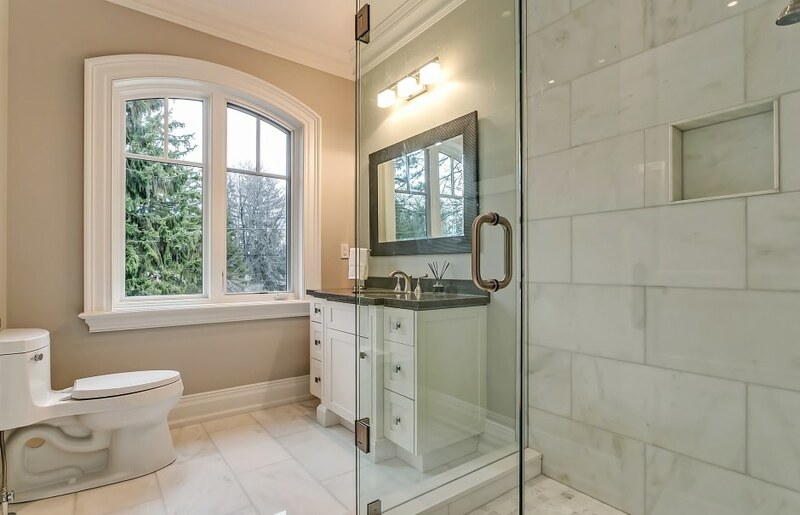 A secondary powder room is available for guests, while a three-piece bathroom services the fifth bedroom guest/nanny suite. An additional office and exercise room with mirrored wall and rubberized flooring complete the lower level. The private rear yard has been outfitted with extensive professional landscaping by JSM Landscaping Design and Construction. Expansive stone terraces provide ample seating areas, in addition to the covered outdoor living room with wood-burning fireplace with full-height stone surround and built-in ceiling speakers. A cabana with built-in outdoor kitchen features a Wolf barbeque and Sub-Zero refrigerator. A sheer waterfall feature with gas fire pit creates ambiance, with plant beds and mature South Oakville trees as the backdrop.